Kenny Baker walks barefoot past a cluster of newly planted fruit trees and a field of squash nearly ready for harvest. The fact that Baker, a farmer, is unshod is unusual. But what's even more noteworthy is his age. While the population of U.S. farmers grows older — the average age is now 57, according to the Department of Agriculture — Baker is just 29. "It's really challenging," admits the cultural anthropology and environmental studies major as he stands on the rich, alluvial soil of his Corralitos land. "It's not easy to start the first generation of a farm." Still, Baker, a 2007 graduate of UC Santa Cruz's Kresge College, is not the kind of guy who gives up. 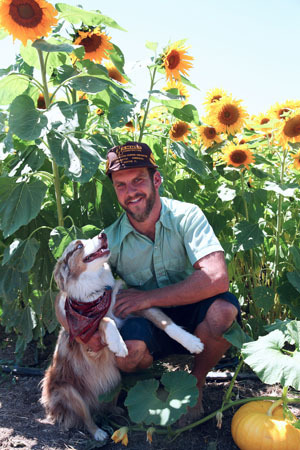 Baker's introduction to farming came when he was still attending UCSC. He got a job at a cut-flower farm and found himself falling in love with the work. After a stint with Happy Girl Kitchen, where he spent his days buying produce from area farmers and absorbing their knowledge, he decided to go out on his own. "I had a bit of cash saved up and I bought a 1963 John Deere tractor and just went for it," Baker says. Baker located a seven-acre parcel of land to lease and named his operation Lonely Mountain Farm after a hill that is home to a clan of dwarves in J.R.R. Tolkien's famous trilogy. (I'm kind of a Lord of the Rings nerd," he admits.) Then, he got to work. He tilled the soil, dug trenches, and piped water to the plot. He planted potatoes and beans — crops that had a long shelf life and also filled a market niche. Daily, he fought the unreliable tractor and weeds that rose among the seedlings he planted. "I was completely flailing around," he says. "Even in the best conditions, starting a farm is a struggle," says Nesh Dhillon, director of Santa Cruz Community Farmers' Markets where Baker now sells his harvest. "It's weather-dependent, and an organic farm means you can't just solve a problem by putting something on it." Still, Baker persevered and, four years later, he is selling crops that range from Native American Hidatsa Shield beans to Delicata squash and heirloom tomatoes in four Bay Area farmers' markets. He also is cultivating an additional plot of land his parents bought and where he now lives with his girlfriend, Molly Davenport, and his sister and his brother-in-law, Dawn and Tim Sternadel. Still, life on the land is not easy. At 6 a.m. Baker makes himself a cup of coffee and goes out to feed the goats, peacocks, and horses that populate his farm. By 7, he's headed for his greenhouse where he figures out the day's agenda based on what he finds. His 10-hour days are filled with weeding, irrigating, planting, harvesting, and dealing with whatever problems arise. "He's got such drive and desire," says Baker's mother, Kelly, a fifth-grade teacher in Southern California. "He believes in what he does. He's driven by the cause … of fresh, organic, local food." Baker gives a tour of his newest farm property as bees dance amid rows of golden sunflowers and his two dogs, an Australian shepherd named Oso and a border collie named Cubby, scramble through acres of tilled soil. There's a large barn, a gypsy wagon he built by hand to serve as a farm stand, an old yellow school bus he uses to haul crops. There is talk of his sister's recent wedding on the farm, and dinners he and his housemates have together most nights: squash stuffed with rice, chard, and goat cheese; big salads; Jerusalem artichokes sautéed in olive oil. In time, Baker hopes this acreage, which nestles between two swells of land, will not only grow a rich variety of crops but also serve as an educational venue for kids, hold a goat-cheese production area and a small kitchen, and possibly host events. "I think I have a good vision," he says. "I can look into the future and see a result." That's what keeps Baker going. That's what keeps his bare feet firmly planted on the land. Lonely Mountain Farm sells its produce at the Downtown Santa Cruz, Sunnyvale, Campbell, and Live Oak farmers' markets. Visit Lonely Mountain Farm on Facebook.